All Climate Mechanical thaws frozen heating pipes by passing low voltage, high current AC electricity through frozen pipes. This can be used on copper heating pipes with aluminum fins, copper and cast iron water supply lines and cast iron drain lines. This method allows us the ability to thaw iron or copper pipes buried in the ground or concealed in building walls. 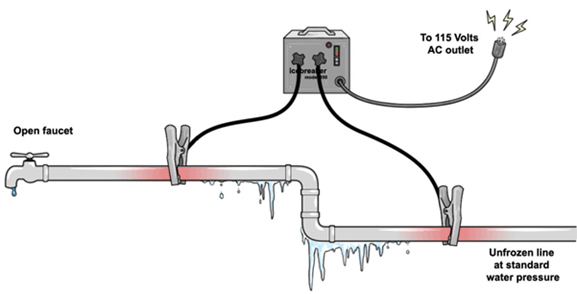 Electric thawing is typically faster and safer than other methods.